The Adjustable Pneumatic Chair height is able to put you at the most convenient height to be able work on your garage needs. 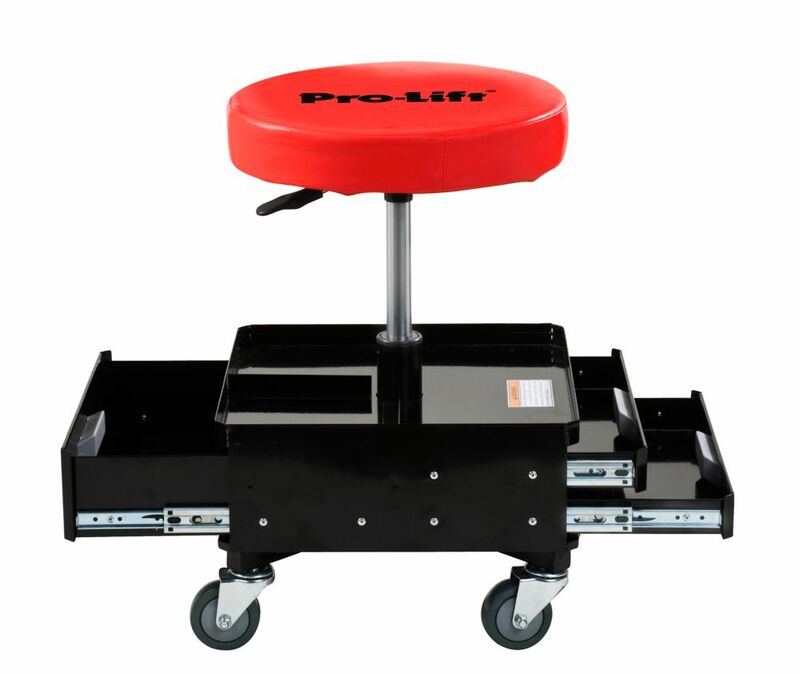 Its durable steel and 4 heavy duty swivel casters make it a reliable chair able to move about your work space, and the convenient tool trays allow you to carry with you the tools needed to get the job done. Adjustable height max: 21-5/8 in. For a period of ninety (90) days from date of purchase, SFA Companies, Inc. will repair or replace, at its option, without charge, any of its products, which fails due to a defect in material or workmanship under normal usage. This limited warranty is a consumer's exclusive remedy. The Mighty Campbell Hausfeld 12 Volt, 150 PSI Inflator (AF010400) is small enough to be portable, yet powerful enough to meet all your inflation needs from sports equipment to RV/truck tires and everything in between. A 31 in. hose with a threaded leak-proof valve and a 10 ft. power cord makes it easy to reach every tire on your vehicle. In a roadside emergency or in your own driveway, this inflator has an accurate, easy-to-read gauge, and a bright LED light for night-time visibility. With the power to inflate a standard R15 tire in under 4 minutes, the powerful motor delivers results in an efficient manner. The AF010400 includes a sports needle, inflation nozzle and Presta adapter to tackle recreational inflation as well. Finish your projects faster and easier with Campbell Hausfeld. No need to fret over a flat tire. The 12V Air Compressor is ideal for cars, bikes and all inflatables. This device plugs directly into any 12 volt power outlet and comes equipped with two nozzle adapters and one sports needle for filling air into a variety of tires and other items. The 12V Air Compressor is excellent for roadside emergencies and has a built-in 250 PSI pressure gauge. The 20 foot pressure hose with lock lets you reach around larger sized vehicles, and the compact design makes it easy to store in any vehicle. Park Smart Tire Saver" Ramps cradle your tires to prevent flat spots from forming during long term storage. Ideal for cars, trucks, SUVs, motorhomes, RVs, trailers and campers. Made of solid PVC, Tire Savers" won't crush, crack or slip. The unique ribbed design on both the top and the bottom, prevent the Tire Savers from sliding on the floor and provides traction for the tire. Comes with a 10 year warranty. Pneumatic Adjustable Work Chair With 3 Drawers The Adjustable Pneumatic Chair height is able to put you at the most convenient height to be able work on your garage needs. Its durable steel and 4 heavy duty swivel casters make it a reliable chair able to move about your work space, and the convenient tool trays allow you to carry with you the tools needed to get the job done. Pneumatic Adjustable Work Chair With 3 Drawers is rated 4.7 out of 5 by 39. Rated 5 out of 5 by Alan from Time will tell the best I ever saw and received... Time will tell the best I ever saw and received and will 5 star recommend sure will find out ! Rated 5 out of 5 by HSV102 from Great work chair! Got this jewel to replace a less functional work stool that I’ve had for too long! This chair is way more comfortable, easier and safer to sit on, rolls great and stores a good mumber of tools! Rated 5 out of 5 by ML from This was a gift for my son, who's rebuilding his... This was a gift for my son, who's rebuilding his truck. He loved the Pro-Lift. Rated 3 out of 5 by Kilo from pneumococcal I only have 3 dislikes : 1) hard to find the handle for seat height 2) Wheels could use brake locks 3) As you move the tool box will spin drawers may open and if you carry it the drawers may open maybe just needs a dangle lock.